Aylesbury United have confirmed that 10 players from last season will return to the club for the upcoming campaign ahead of next week’s opening pre-season friendly. The bulk of last year’s squad has been kept together by manager Glyn Creaser, who led the Ducks to mid-table in Division One Central. Those players who have signed Southern League forms are: Jack Wood, Jake Bewley, Greg Williams, Alex Collard, Lea Coulter, Ollie Stanbridge, Jack Sillitoe, Alex Chilcott, Ollie Hogg and Ryan Kinnane. Further new signings are expected to be announced in the coming weeks as Creaser constructs his squad for the new season. Meanwhile, the FA Cup and FA Trophy early round draws have been released by the FA. United will face an Emirates FA Cup away trip to Spartan South Midlands League League Premier Division opposition, with the winner of Edgware Town or Leverstock Green hosting the Ducks on Saturday, August 19. 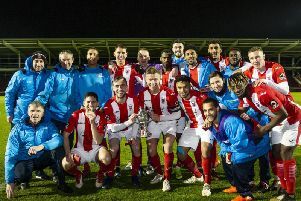 In the Buildbase FA Trophy, the Ducks have been drawn away at Bostik (formerly Ryman) League Division One side AFC Sudbury in the preliminary round, with the tie scheduled for Saturday, October 7. The winners will be away at Metropolitan Police in the first qualifying round. Aylesbury get pre-season up and running away at Bovingdon next Tuesday, followed by a trip to Risborough Rangers four days later. The Ducks are also scheduled to play Tring Athletic, Aston Clinton and Chesham United over the next month prior to their league opener on Saturday, August 12.